The world wide famous products with a unique design that gives the products that exclusive classic Synthesis look. Essentially the same design as the Nimis, but with volume control by remote using a balanced motorized volume control that does not degrade the sonic qualities of the unit. 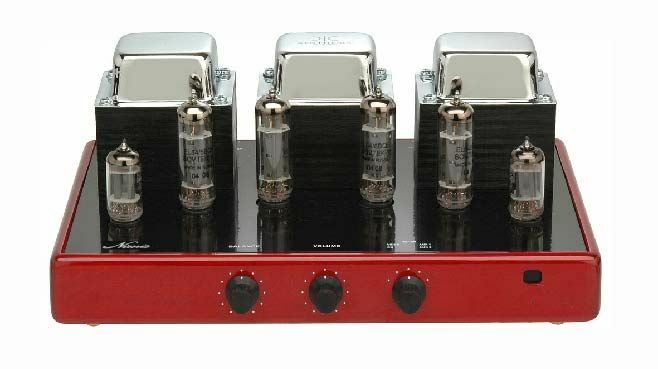 Particular attention has been dedicated to build a output transformers using a selected hi-grade iron for to reduce loss and obtain a low distortion factor and band wide frequency response. This tube integrated combining the highest performance with the cost and quality benefits made possible by our state-of-the-art production facilities. The Nimis has a rated output of 15 watts per channel into 6Ω. Front: Input switch selector, volume, balance, IR receiver, Led. Rear: On-Off switch, male power sck, RCA gold plated connectors, binding posts, protection fuse. Inputs: 4 Input line level, Cd player, Tuner, Video, AUX.